For those who don’t know, Oscar-winning actor Nicolas Cage took his name from a comic book character, Luke Cage from “Power Man and Iron Fist,” who is essentially bulletproof and very strong. To put into perspective, he is like “Superman,” sans the flying around the world scenario. Going back to my youth, the 1980’s decade, the comic book “Power Man and Iron Fist” was amongst my favorite reads. My friend Mike was more a fan of “Daredevil,” as I was too, but for me the stylings of Luke Cage (Mike Colter) and Danny Rand (Finn Jones) were more in my wheelhouse. The duo had little in common, but were both residents of the Big Apple. 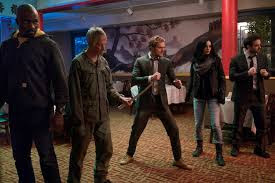 Now, going back to “The Defenders,’ this is another in their line of Marvel-based tales that work on every single level, since the Netflix-produced shows spare no expense at putting money on the screen. As I have said in the past, I’m almost at the point of super hero fatigue, but so long as the quality is outstanding, I will keep watching what it is put out there. “The Defenders” finds the character facing off against The Hand, a group of antagonists who are nothing more than pure evil. Their leader is Sigourney Weaver’s Alexandra Reid, a wealthy socialite who has enough money power to facilitate her own private orchestra. The pacing on all the episodes results in a worthwhile story and character arc. What is really cool was seeing how strong Jessica Jones (Krysten Ritter) is when she can carry an elevator with both Luke Cage and Iron Fist with very little effort, in that she hardly breaks a sweat doing it. It is also interesting to see the fight sequences and fist battles. The fight choreography amazes, since a bunch are set up in well-lit sequences. They are not just showcased for dimly lit sound stages, rather wide open hallways and corridors. Also important to the story are Stick (Scott Glen) and nurse Claire Temple (Rosario Dawson). They each serve a purpose in the total tale of “The Defenders,” since Stick deals with both former pupils with Daredevil (Charlie Cox) and Elektra Natchios (Elodie Young). Claire is involved because she has a relationship with Luke Cage and thinks a partner and friend would do him some good. This show works because it fleshes out the characters and identities. Of course there are motivations, each saga and character has their own resolution kin the end.